2. 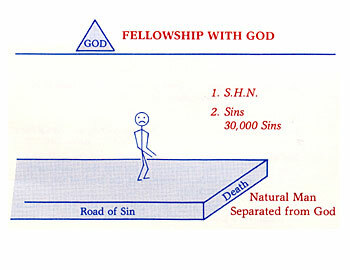 Our sins also separate us from God. 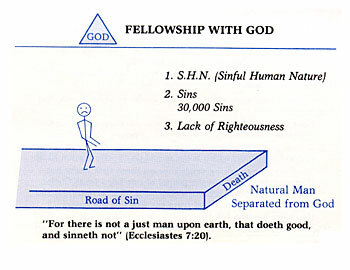 God is holy and can have no contact with sin. No sin can enter heaven. "But your iniquities have separated between you and your God, and your sins have hid his face from you, that he will not hear" (Isaiah 59:2). "For from within, out of the heart of men, proceed evil thoughts, adulteries, fornications, murders, thefts, covetousness, wickedness, deceit, lasciviousness, an evil eye, blasphemy, pride, foolishness: all these evil things come from within, and defile the man" (Mark 7:21-23). Have you ever had any of these thoughts? I know I have. Just suppose we could project all the thoughts you have had during the past 30 days on the TV screen for all of your friends and neighbors to see, wouldn't that be great? They would see what God sees every day. Let's suppose you are 30 years old and let's say you have committed only 3 sins per day. That would be about 1,000 sins per year. This means you have broken God's law approximately 30,000 times! It really adds up doesn't it? 3. Our lack of righteousness also separates us from God. "...Be ye holy; for I am holy" (I Peter 1:16). "Be ye therefore perfect, even as your Father which is in heaven is perfect" (Matthew 5:48). "As it is written, there is none righteous, no, not one, for all have sinned, and come short of the glory of God" (Romans 3:10,23). "For as many as are of the works of the law are under the curse: for it is written, cursed is every one that continueth not in all things which are written in the book of the law to do them" (Galatians 3:10). "For whosoever shall keep the whole law, and yet offend in one point, he is guilty of all" (James 2:10). I haven't lived a perfect life, have you? We have broken God's law, we are not righteous.